These are The Best Crepes! 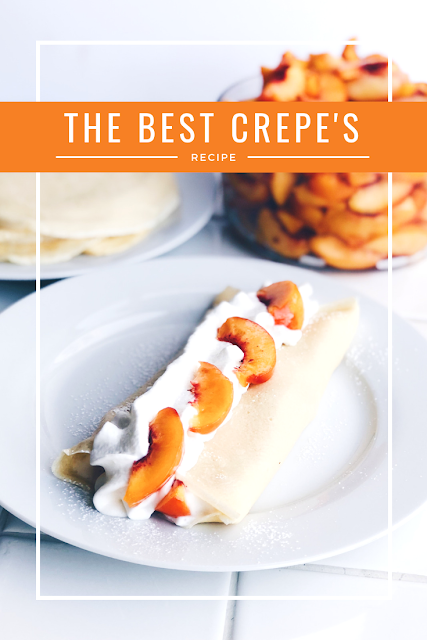 The crepes have a delicious flavor and they come out perfect every time! This recipe couldn't be easier too! Simply place all of the ingredients in a blender and let the blender do all of the work! You can top these crepes with any toppings you like! My personal favorite topping for the fall season is fresh peaches, whipping cream, and powdered sugar! Make it with me! I make my crepes in a frying pan. If you have a crepe maker or machine thingy, feel free to use that! If you don't, that's okay! I don't either! I have always made my crepes in a frying pan and it works every time! Here's what you'll do. Prepare the batter in a blender. Preheat a small frying pan to medium heat. Keep butter close by. I like using butter better than a non stick spray. Place a tablespoon of butter in the frying pan, allowing it to melt. Turn the frying pan from side to side to make sure the butter covers the entire pan. Repeat this step one every 3 crepes or whenever the pan begins to stick. While holding the pan in one hand, place about 1/4 cup of batter on one side of the pan, and begin tilting the pan in a circular motion. When the batter makes it all the way around the pan, place back on heat. Allow the crepe to cook for about 30 seconds to 1 minute on this side, until it becomes bubbly and the edges start to pull away. Flip the crepe using a spatula and cook on the other side for an additional 30 seconds. Place the cooked crepe aside and repeat steps 4-6. Place all ingredients in a blender, and blend on high until smooth. Heat a frying pan to medium/low heat. Pour or scoop the batter onto the griddle, using approximately 1/4 cup for each crepe. Tilt the pan with a circular motion so that the batter coats the surface evenly. Cook the crêpe for 30 seconds or so. Run a heatproof spatula around the edge of the crêpe to get it unstuck from the sides. Slowly slide the spatula down the center of the crepe and then flip. Slide the crepes into a flat pile and let them cool a bit while you repeat the process and make more crepes. Top with fresh fruit, whipping cream, cinnamon, powdered sugar, syrup, nutella, peanut butter, jam, jelly, or whatever your favorite topping is! Print the Crepe recipe here!